In case you missed it yesterday, Spend Matters launched an entirely new solution area — featuring three distinct solution categories — as part of its Q3 SolutionMap. 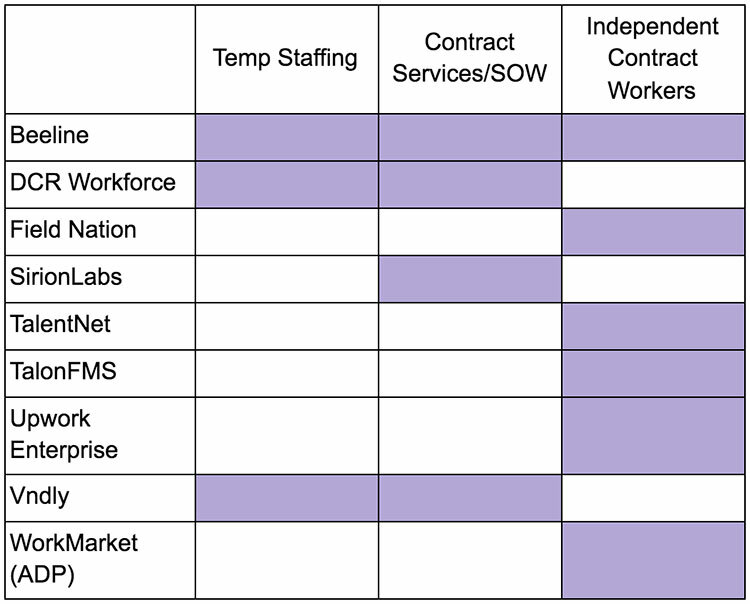 For the first time, our analyst team has begun evaluating Contingent Workforce and Services (CW/S) enterprise software vendors, addressing the sourcing and management of Temp Staffing, Contract Services/Statement of Work (SOW) and Independent Contract Workers (ICW), in the context of SolutionMap. Click on each category name above to read a detailed, high-level description of that category and view the persona graphics for free. “With the contingent labor and services growing so quickly and changing seemingly week to week, Spend Matters is excited to finally offer comparative rankings of software companies in this space,” said Andrew Karpie, our research director of services and labor procurement and lead analyst on the CW/S SolutionMap. The CW/S SolutionMaps represents Spend Matters’ first deep-dive into the sourcing and management solutions for a specific set of spend categories. Unique to the approach is the breakdown of the homogenous VMS solution category into suite capabilities and standalone solutions that address requirements for management of spend on temporary staffing, contract services/SOW and independent contract workers. The CW/S environment is changing in significant ways, as Karpie notes in the video. With a buyer-centric, persona-based approach to comparative rankings and quarterly updates of those rankings, SolutionMap is an ideal set of tools for tracking the rapidly changing CW/S sector. Which Software Companies Make the List? Need More of a Primer on SolutionMap in General? To get a sense of all the companies participating in all categories across the Q3 release, how to access comparative rankings for free, and how to subscribe to deep-dive research content, check out our post on the Q3 release here!